This post contains affiliate or sales links. One of the world’s top 50 chefs according to Pellegrino, Chef Andreas Caminada recently revealed his must-try Swiss dishes and favorite Swiss restaurants in an interview for Switzerland: 100 Locals Tell You Where to Go, What to Hike, & How to Fit In. 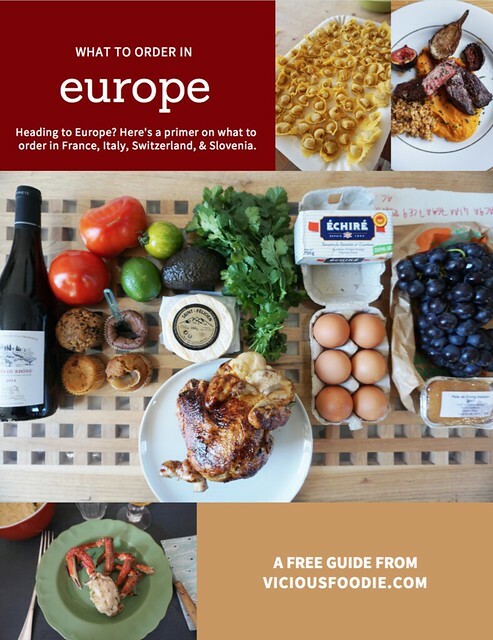 If you’re wondering where to eat in Switzerland, perhaps his list is a good place to start. This gourmet restaurant near Lausanne is one of only three three-Michelin-star dining rooms in all of Switzerland, so perhaps it’s no surprise that the chef behind one of the other two highly recommends it. Michelin calls new head chef Franck Giovannini’s dishes majestic and Chef Caminada seems to agree, saying in his interview that it “doesn’t get much better than that.” Expect a classic dining room serving French-style cuisine with sauces reviewers love to laud. According to Andy Hayler, “The wine list was extensive and expensive. 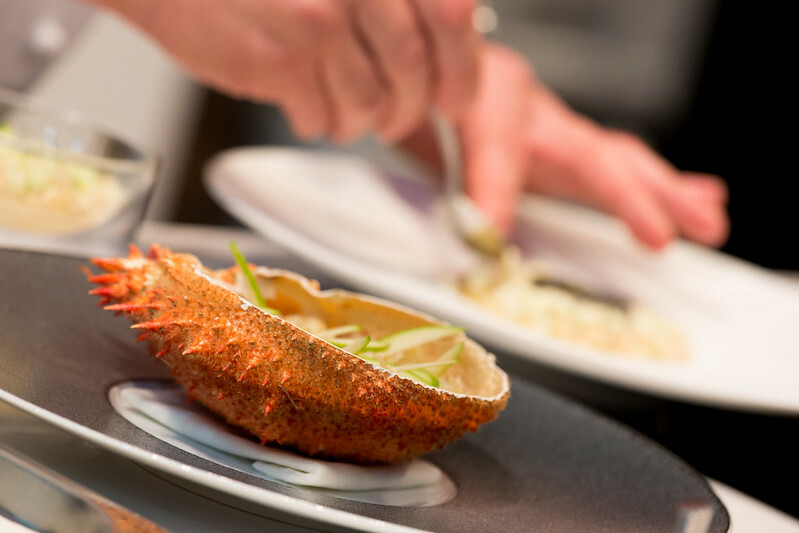 The cheapest bottle listed was CHF 70 (£54) and prices went rapidly up from there.” And according to Michelin, tasting menus start at 295 for lunch and rise accordingly from there. Photo credit: l’Hotel de ville. On the shores of Lake Lucerne, the small town of Vitznau was the site of the world’s first rack and pinon railway to the summit of Rigi. Most tourists come for the rail and the views, but the town also plays host to one of Chef Caminada’s top picks: Parkhotel Vitznau. The exterior is reminiscent of a castle and the interior hosts 47 guest rooms and suites. There are two restaurants in the hotel. The first – Restaurant Focus – is accessed through a series of glass-walled wine cellars and describes its dishes as gourmet cosmopolitan. The second – Resaurant PRISMA – is a European-Asian fusion restaurant with floor-to-ceiling windows and a waterfront dining patio. This Zürich restaurant boasts the “most unbelievable collection of art you’ll ever see in a restaurant,” according to Chef Caminada. And with original art by Picasso, Chagal, and Miró hanging on its walls, who’s to argue? Michelin calls both the atmosphere and cooking “traditional” and lists the restaurant among its recommendations, though it does not have a star. Chef Caminada says to order a rösti with sliced veal and mushrooms in cream sauce for something decidedly Swiss but also decidedly upscale. Also located in Zürich, this restaurant is yet another located inside a magnificent building reminiscent of a castle. Charmingly, it’s also perched above the city with the views you’d expect from that perch. The restaurant boasts 19 Gault Millau points and two Michelin stars. 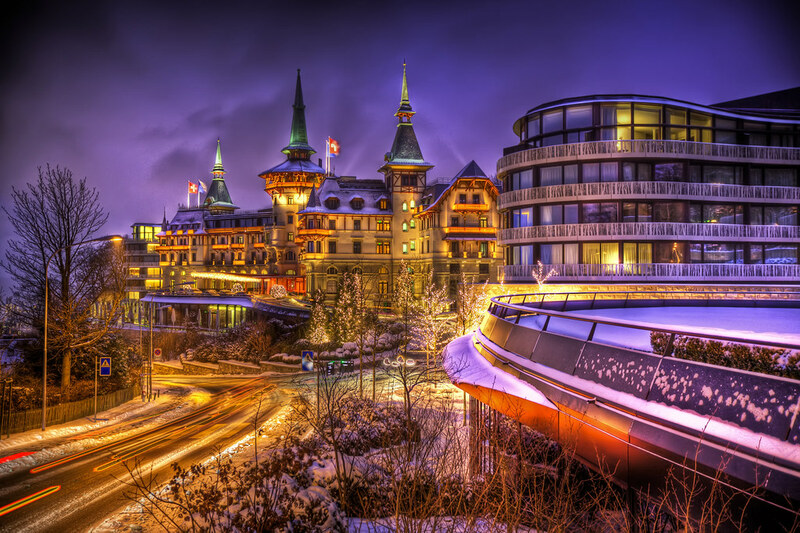 Photo credit: exterior of the Grand Hotel Dolder. Back in Chef Caminada’s home canton of Graubünden, Hotel Gasthouse Krone in La Punt-Chamues-ch is Michelin recommended and has 15 Gault Millau points. They describe their cuisine as market-fresh and made with regional ingredients, and the restaurant interior is unpretentious and welcoming (which I love). Of Chef Caminada’s picks, this one sounds least pretentious and most charming. Of course, if you’re taking Chef Caminada’s recommendations, you should probably also visit his restaurant – the top in Switzerland and one of the top in the world. Schloss Schauenstein is located in a historic castle in the canton of Graubünden and a three-course meal starts at 216 CHF. Pellegrino describes the castle as a fairy-tale and lauds it for its remote, romantic location (in quite possibly the smallest town in the world). Expect surprising flavors and perfect balance.